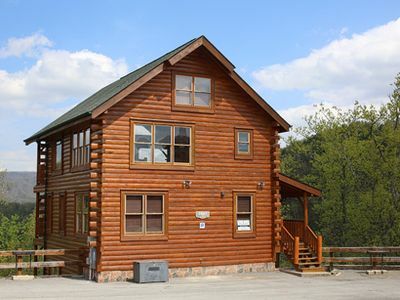 Find tons of things to do in the Smoky Mountains when you stay in this real log cabin rental. 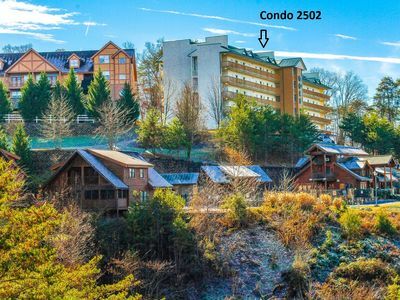 Located just off highway 441, in between Gatlinburg and Pigeon Forge. 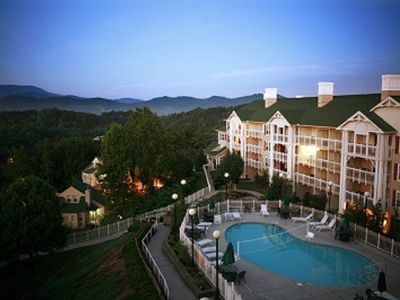 Mulberry Hill is just minutes away from all the great attractions in the smokies. 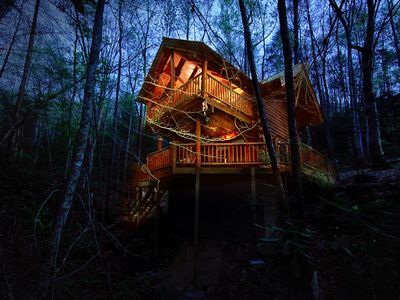 It’s in a private, wooded setting with the Smoky Mountains literally at your front yard. What better views could you get than that? 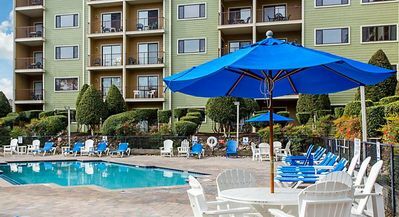 You can bring your friends, your family, and you can even bring your pets! 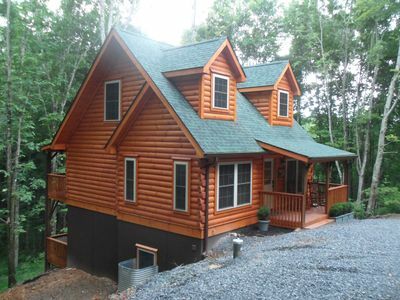 This is a pet friendly cabin.Find a two bedroom Smoky Mountain cabin rental in Mulberry Hill. 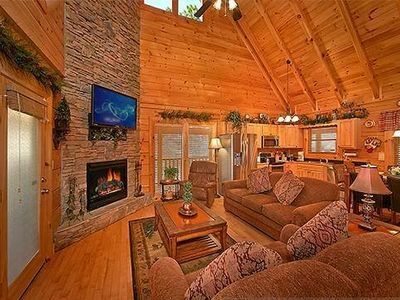 This vacation rental in Pigeon Forge Tennessee is your passport to the Smokies. 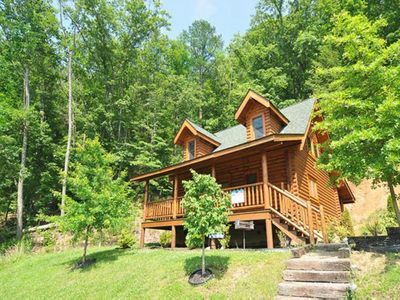 This real log cabin is also close to downtown Gatlinburg. 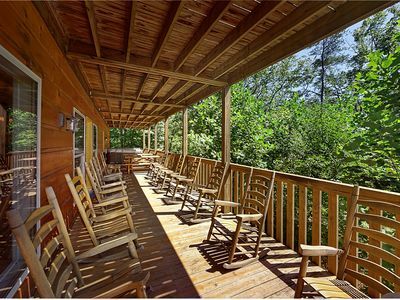 You can sit and enjoy your morning coffee in the rockers or swing on the front porch or you can sit and enjoy your evening wine! 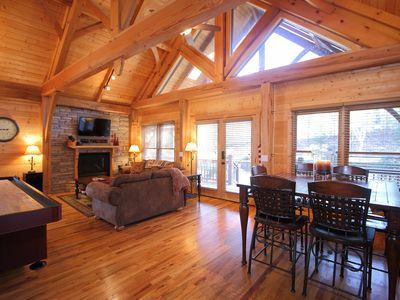 The entry level of the vacation cabin has a large, comfortable living area and a wood burning stove insert in the fireplace. Just imagining curling up in front of the fireplace with a well-loved book, soaking in the serenity and peacefulness of Mulberry Hill. The kitchen is spacious and has everything you need to prepare your meals. 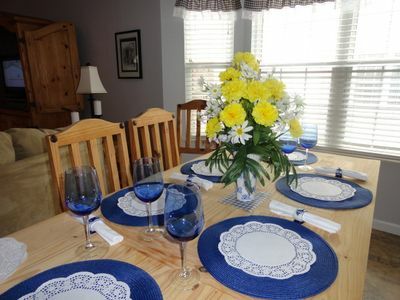 You can eat together at the table with your family, friends, or just you and your loved ones! 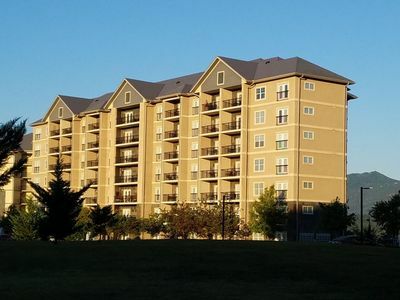 Being able to cook your own meals can save you money instead of going out for each meal, but if you’re craving something or you simply don’t want to cook, you can find the best restaurants in Pigeon Forge and Gatlinburg. 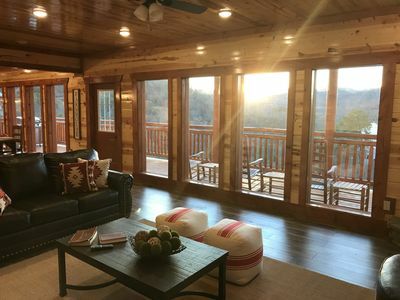 The entry level of this smoky mountain cabin rental has a queen-sized bedroom with television, along with a private two-person whirlpool tub to soak in after a day of shopping in Gatlinburg, hiking in the smokies, biking along the Pigeon Forge Parkway, or whatever else you might have spent your adventure packed day doing. There is also a full bath on this level with a tub and a shower. 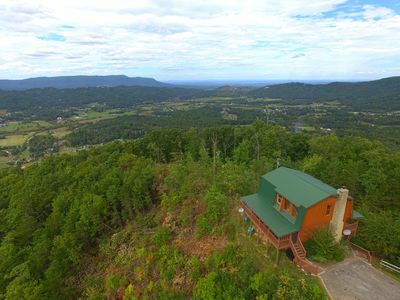 The upstairs of this authentic log cabin has another queen-sized bedroom with television and a full bath. So, no fighting over who gets to brush their teeth first! There is also two single roll away beds to accomadate those additional four guests. 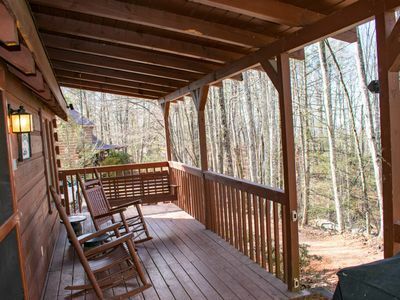 Just off the dining room is a screened in porch, perfect for enjoying the beautiful Smoky Mountain evenings. Just think of relaxing in an area rich in nature and knowing it’s your own personal haven from the hustle bustle of the rest of the world. The screened in porch also has an air hockey table for you to enjoy. 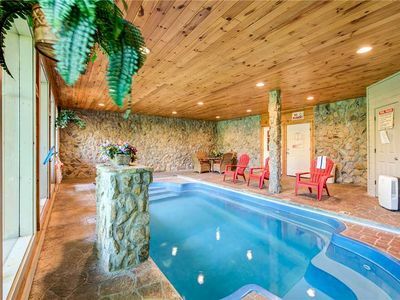 Just off the porch is a six-person private hot tub. 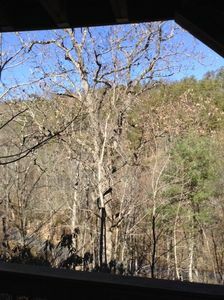 You can also listen to the sounds of nature at night around the outside fire pit in this Smoky Mountain cabin rental. 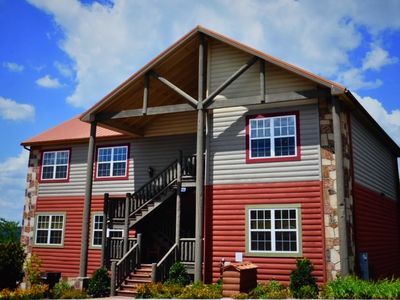 Some of the many amenities of this real log cabin include a washer and dryer so you can make sure your linens stay clean and comfortable, that way you never run out of towels, no matter how many showers, baths, or soaks in the hot tub you take! There’s also a sofa sleeper, Wi-Fi, and high-speed Internet. Please note: this is a pet friendly property. A pet fee would be incurred for guest with pets which excluded from online pricing.. 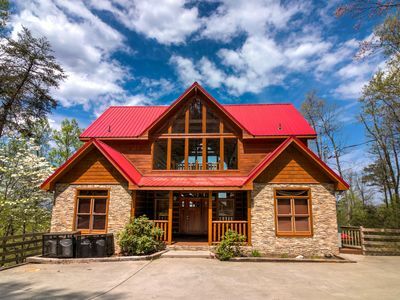 LUXURY 2/2 CABIN WITH INDOOR/OUTDOOR RESORT POOL IN FANTASTIC LOCATION!! 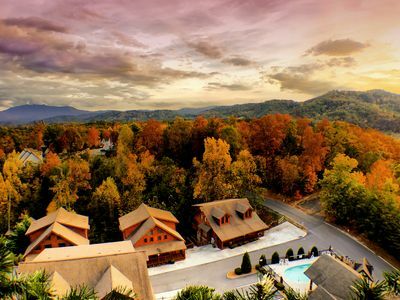 Mountain Dreams is your dream come true vacation rental in the Great Smoky Mountains.